Once you build your investment capital and begin investing in bonds, you are likely to hear about bond credit ratings, specifically Triple-A bonds, or AAA bonds as they are commonly known. This designation might seem confusing but it really comes down to understanding how "safe" a bond is by looking at all sorts of metrics, such as the strength of the issuer's balance sheet, the likelihood of sufficient earnings and cash flows to cover the promised interest and principal repayments, and the collateral that can be seized in the event the bond defaults prior to or at bond maturity. 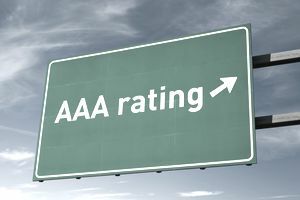 Triple-A bonds, or AAA bonds, are those considered the absolute safest by the bond rating agencies responsible for determining their grade. The bond rating agencies are signaling that they think default - that is, you not getting the money you were promised when you were promised it - is all but unthinkable except in the most remote of circumstances. Bonds with an AAA rating are considered just below those of sovereign bonds issued by well-run governments, the latter only superior for the fact they possess the authority to tax and have standing armies that can guarantee the repayment of obligations. Due to their rock-solid status, AAA-rated bonds offer the lowest yields. What you gain in peace of mind you lose in income because other investors are willing to bid up the bond price, especially when things go south (this is known as a "flight to safety"). With AAA rated bonds at the top of the investment grade class, D rated bonds are at the bottom. A rating of D indicates the bond has already gone into default. D rated bonds are part of a category known as junk bonds. Average investors would do well to stick entirely to investment grade bonds. As you go down the bond rating ladder, default probabilities rise substantially. Reaching for yield has cost a lot of families a lot of lost wealth. Often, the higher interest rate is an illusion that is taken away when the bond stops sending you interest altogether or you find yourself getting a bankruptcy notification.